Unless you plan on using battery power for everything, you will need a Power Inverter. Since the majority of modern conveniences all run on 120 volts AC, the Power Inverter will be the heart of your Solar Energy System. 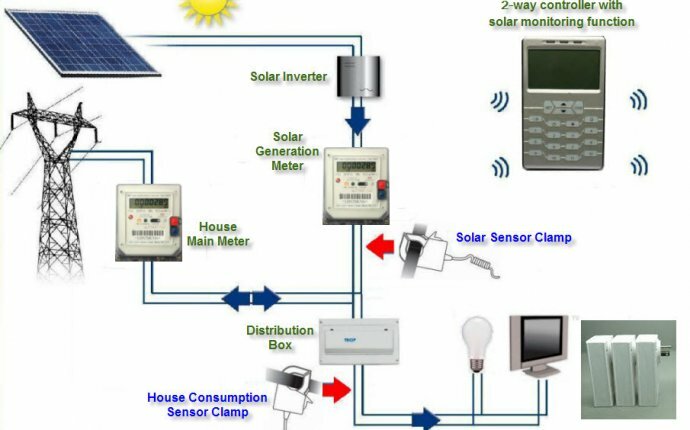 It not only converts the low voltage DC to the 120 volts AC that runs most appliances, but also can charge the batteries if connected to the utility grid or a AC Generator as in the case of a totally independent stand-alone solar power system. Square Wave power inverters : This is the least expensive and least desirable type. The square wave it produces is inefficient and is hard on many types of equipment. These inverters are usually fairly inexpensive, 500 watts or less, and use an automotive cigarette lighter plug-in. Don't even consider one of these types of power inverters for a home system. Modified Sine Wave power inverters : This is probably the most popular and economical type of power inverter. It produces an AC waveform somewhere between a square wave and a pure sine wave. Modified Sine Wave inverters, sometimes called Quasi-Sine Wave inverters are not real expensive and work well in all but the most demanding applications and even most computers work well with a Modified Sine Wave inverter. However, there are exceptions. Some appliances that use motor speed controls or that use timers may not work quite right with a Modified Sine Wave inverter. And since more and more consumer products are using speed controls & timers, I would only recommend this type of inverter for smaller installations such as a camping cabin. True Sine Wave power inverters : A True Sine Wave power inverter produces the closest to a pure sine wave of all power inverters and in many cases produces cleaner power than the utility company itself. It will run practically any type of AC equipment and is also the most expensive. Many True Sine Wave power inverters are computer controlled and will automatically turn on and off as AC loads ask for service. I believe they are well worth the extra cost. I use a True Sine Wave power inverter myself and find that its automatic capabilities makes it seem more like Utility Company power. The Xantrex 2500 watt power inverter I use has a search feature and checks every couple of seconds for anything that wants AC, then it powers up automatically. You just flick on a light switch (or whatever) and it works. When you turn off the light or the refrigerator kicks off for example, the power inverter shuts down to save battery power. While the Modified Sine Wave inverter (sometimes called a Quasi Sine Wave inverter) is nearly half the price of a True Sine Wave inverter, I would still recommend using a True Sine Wave inverter if you want to supply automatic power to a normal home using a wide variety of electrical devices. Also, most appliances run more efficiently and use less power with a True Sine Wave inverter as opposed to a Modified Sine Wave power inverter. Grid Tie Power Inverters If you are connected to normal Utility company power and just want to add some Free Sun Power electricity to reduce your electric bill and you do not need a totally independent system, it is possible that a Grid Tie power inverter will suit your needs. With a Grid Tie power inverter, whatever electricity that your solar panels produce will reduce the amount supplied by the utility company, in effect lowering your bill. And, if you are producing more power than you are using, you can actually sell the extra power back to the utility company! For this type of setup a much smaller battery bank can be installed just to cover short term outages from a few minutes to an hour or two. In fact, if you don't have frequent long term power outages and don't need back-up power, then you will not need any batteries at all. (But, really, what utility company never fails? :) Input voltages. Should I use a 12, 24, or 48 volt inverter? The main consideration when deciding on the input voltage (from your battery bank) of your Inverter is the distance between your solar panel array and your battery bank. The higher the voltage, the lower the current and the smaller the (expensive) cables need to be. Of course, when you decide on a system voltage, the Solar Panels, Inverter, and Battery Bank all need to use the same voltage. More detailed information on voltage & current is explained in the tutorial on Power & Watts. To help decide on which voltage to use, check out our Wire Size Calculator which can tell you what size wire is needed to connect the solar panels to your equipment area. You can try all 3 different voltages to see the change that it can make in wire size. Course corporate fraud investigation training is very difficult.